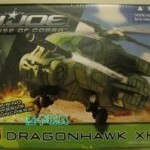 TaoBao member macca428 has posted auctions for the upcoming G.I.Joe Rise Of Cobra G.I.Joe Dragonhawk XH1 and Cobra Para-Viper. The Dragonhawk was first discovered in K-Mart’s computer system. When pictures of the vehicle first surfaced, it was unclear whether or not this was the same vehicle previously reported on by our own Shin Densetsu. The vehicle includes Wild Bill and is sure to fly off shelves! The Cobra Para-Viper is a repaint of the first version, this time in black, gray & red. The figure also comes with a spring loaded missile launcher, a key gimmick in the Rise of Cobra line. Click on the Headline Title Bar to view more pictures! Thanks go to SNAKE EYES from HissTank for the intel!